First, each time you make a purchase, present your passeportaylor. You’ll earn points on all your purchases, even sale items. 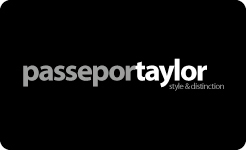 On top of that, your passeportaylor offers exclusive privileges. From time to time, you’ll receive promotional offers by email. Take advantage of them! Value of your points: 2% of your purchases. Double your points on your Birthday. Stylist at your service by appointment only. Merchandise can be returned up to 45 days.